Back in January, we posted an article about the formation of New Jersey’s state-level cultural heritage emergency network, the New Jersey Cultural Alliance for Response (NJCAR). The network’s activities continue in high gear. Michele Stricker, Associate Director of Library Support Service at the New Jersey State Library, has agreed to serve as the Chair of NJCAR. Four standing committees have been established – Membership, Information Resources, Program, and Development – and each chair will be selecting members for their respective committees. On February 17, 2015, the NJCAR By-laws were adopted by a unanimous vote. The by-laws are available on NJCAR’s new website. NJCAR has already planned two activities for New Jersey – two intensive hands-on disaster response and recovery workshops to increase practical knowledge through a simulated disaster, and a statewide summit to introduce NJCAR to cultural institutions and emergency responders at the local and regional levels. The trainings and summit will be held at regional police and fire training centers in north, south, and central New Jersey to increase participation by local emergency responders. Heritage Preservation is proud to be one of NJCAR’s founding organizations. In January, the U.S. Army Corps of Engineers (USACE) released the North Atlantic Coast Comprehensive Study. The goals of the study, authorized under the Disaster Relief Appropriations Act, Public Law 113-2 are to reduce flood risk to vulnerable coastal populations, and promote coastal resilient communities to ensure a sustainable and robust coastal landscape system, considering future sea level rise and climate change scenarios. The study area, encompassed approximately 31,200 miles of coastline. Please visit here to learn more about the study. In 2011, the state cultural heritage emergency network COSTEP MA (Coordinated Statewide Emergency Preparedness in Massachusetts) received a three-year Hazard Mitigation grant from FEMA through the Massachusetts Emergency Management Agency. The goal of the project was to increase public awareness – particularly by cultural stewards, emergency managers, municipal planners, and other town officials – of mitigation actions that could safeguard cultural collections in their municipality. The project encouraged collaboration between the cultural and emergency management communities for the protection of cultural and historic resources. Deliverables included conducting 14 community meetings across the state, offering four Risk Assessment and Mitigation Planning workshops, and producing a framework on how others can conduct a similar program at the state, regional, or local level. The framework – Mitigation for Memory: A Disaster Mitigation Framework for Cultural Resources – is available here on COSTEP MA’s website. If you have any questions, contact Gregor Trinkaus-Randall, Preservation Specialist, at the Massachusetts Board of Library Commissioners. The U.S. Army Corps of Engineers announced in a press release that it has just released the North Atlantic Coast Comprehensive Study (NACCS). The report brought together experts from Federal, state, and local government agencies, as well as non-governmental organizations and academia, to assess the flood risks facing coastal communities and ecosystems and collaboratively develop a coastal storm risk management framework to address increasing risks, which are driven in part by increased frequency and intensity of storm events and rising sea levels due to a changing climate. The NACCS provides tools and information, including a nine-step Coastal Storm Risk Management Framework that can be used by communities, states, tribes, and the Federal government to help identify coastal risk and develop strategies for reducing those risks. The report and all associated documents and tools are available here. A recent article in NJ Municipalities magazine highlighted the role that libraries and librarians have played in disaster response and illustrates ways that librarians can pursue a more active role in assisting first responders and federal agencies in the wake of a disaster. “Sheltering in the Stacks” describes how, after Superstorm Sandy, many New Jersey libraries served as not only community centers – places where residents could come to recharge cell phones, get a warm drink, or stay comfortable and safe – but also as unofficial Disaster Recovery Centers. As trusted public resources, libraries are an obvious choice for people to turn to in the event of a disaster, especially for access to and assurance of accurate information. In addition to these ways that libraries assisted their patrons, the article also encourages libraries and librarians to organize Virtual Operations Support Teams (VOSTs). VOSTs consist of community volunteers who are trained to support the efforts of officials and first responders by bringing crucial information to their attention, collecting and prioritizing disaster-related reports from the public through social media. The New Jersey State Library has recognized the importance of libraries and librarians in both resiliency and post-disaster recovery work and are creating a toolkit to help these “information first responders” in their work. The toolkit will consist of online resources designed to train librarians in proactive response techniques, and will include tools to increase preparedness, develop a disaster recovery plan for the facility itself, and provide advice on budgeting, operational challenges, and expectation management. The toolkit will provide information tailored to assist different parts of the community, such as local businesses, non-profit organizations, and other members of the public, allowing librarians to feel confident advising patrons on subjects ranging from documentation and business insurance to federal and private loans. The resources in the toolkit will aid librarians in disaster planning, response, and mitigation, providing a comprehensive picture of the roles and responsibilities libraries can fill in the community in the event of a disaster. The New Jersey State Library will present the completed toolkit at the New Jersey Library Association Conference in April, paving the way for other states to create similar resources. For more information about this exciting project, contact Michele Stricker, Associate Director, Library Support Services, at the New Jersey State Library. The latest initiative developed by the disaster network Delaware Disaster Assistance Team (DDAT) is a unique partnership between DDAT member institutions and the student chapter of the International Association of Emergency Managers (IAEM) at the University of Delaware (IAEM@UD). Last fall, DDAT launched a pilot program to pair up graduate student volunteer teams of 2–3 students to work with representatives of DDAT member organizations to assess their existing institutional disaster plans (if they had one) and to make recommendations and provide support and resources to either create a plan or enhance an existing one. This is as a win-win project: DDAT member organizations get semi-professional support and assistance with a task that many seem to find daunting but that is, of course, at the core of any organization’s preparedness, while the student volunteers gain valuable experience not only consulting on the development of disaster plans but also in interacting with cultural heritage organizations, which gives them a unique perspective and challenge. The initial pilot involving a library has just been completed, and results were both informative and positive. A second pilot involving a museum will be initiated soon, and a full roll-out of the program will take place early this spring. Work is also underway to incorporate graduate students in UD’s Museum Studies Program as assessment team members assigned to museums to strengthen the teams’ skill set. To learn more about the partnership project, contact Pat Young at the Disaster Research Center, University of Delaware. A number of initiatives have contributed to the recent spate of activity that is enabling the Garden State’s cultural heritage and emergency management communities to move forward together on emergency preparedness. From the Regional Emergency Response Networks project in 2012 to the creation of the New Jersey Cultural Alliance for Response network in 2014, New Jersey has been moving full speed ahead! 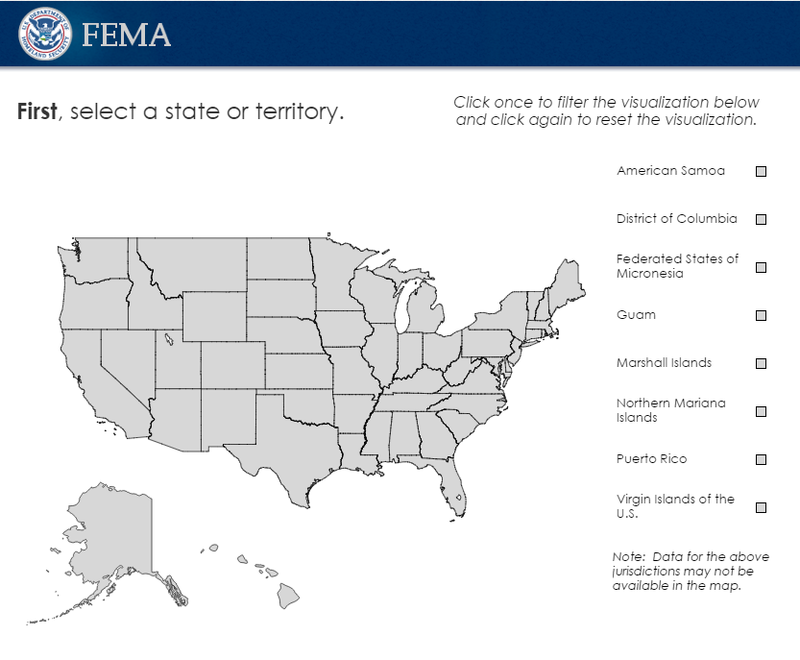 As part of the commitment to increasing the transparency and accessibility of data, FEMA introduced a new interactive tool to allow the public to explore currently available FEMA grant data. The tool, available at www.fema.gov/data-visualization, allows the public to see a visual representation of the agency’s federal grant data as it relates to fire, preparedness, mitigation and public assistance. The tool also visualizes disaster declarations by state, hazard and county. The tool is in BETA because FEMA is seeking comments on how it can be improved, so comments and suggestions are welcome. FEMA will continue to add data and update the visual based on feedback in the coming months. The OpenFEMA data used in the visualization were derived from the publicly available datasets on www.fema.gov and www.data.gov. FEMA is committed to updating these existing datasets in a timely manner and as feasible, to provide new datasets for our external partners to manipulate and use. Click the image below for more information.